In a world of constant distraction, how does one focus and, ultimately, master one’s own mind? How does attention—or the inability to attend and concentrate on what we think is important—shape identity and sculpt the self? 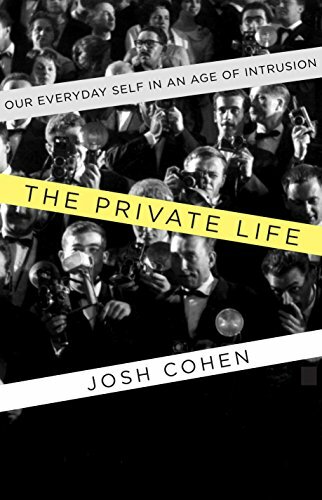 In The Private Life: Our Everyday Self in an Age of Intrusion Josh Cohen shows these questions to be tougher than they appear. Cohen is many things: a practicing London psychoanalyst, professor of literary theory. Unsurprisingly, his current book is many things, too. Privacy is the prime topic. Does it, first of all, even exist anymore? We live in a voyeuristic and exhibitionistic society whose hunger for scandalous revelation is insatiable. The forces of social media, radio, and television seem hell-bent on coercing people into broadcasting their inner and outer lives. Anonymous trolls can criticize and unleash “a storm of licentiousness and evil.” Public shaming, gone viral, has destroyed lives. Everything is public now, and this fact is hard to resist. Moving beyond diagnosis, Cohen turns to literature and philosophy to recall an earlier “virtuous public life [that] wasn’t possible without a private realm into which the mind and body could withdraw.” It is from this private self that the tabloid imagination seeks to drag the individual. No one has a right to a private life any longer, certainly not celebrities or politicians. Yet these kinds of people are the emblems of a paradoxical impulse common to us all: To show off yet conceal, speak but not be found out, have the world see us for the singular individual we are while shielding it from that world’s prying scrutiny. Showing how a life spent entirely in public becomes shallow, Cohen then illustrates its opposite, that private life is the first enemy of totalitarian rule. In a world increasingly beset by dictators it is precisely the person, “who keeps a thought, an intimacy to himself” that is in danger of being silenced and made to conform. The pleasure we take in media buzz and the scandal du jour stems less from whatever secrets they might reveal then from the giddy anticipation that we might glimpse into the target’s private life. We become mesmerized and hooked by relentless revelations and factoids that tantalize, promise, and beckon without ever gratifying our desire to see inside. We’ve already seen it all, so why keep looking? And yet we do. We are an irreducible double, expertly able to hide how we feel from others and ourselves. Not only are we a stranger to our private self, Cohen argues, but that self isn’t always a friendly one. And so we remain better readers of other people’s inner lives than we are of our own. It would seem logical that we could apply the same power of inference used on others to ourselves. But Cohen shows us why we are deluded and “clueless” as to what we are really thinking, feeling, and doing. Screen junkies are out of touch with the real world and with themselves. Everywhere, Cohen says, we see this flight into external life. Yet what you say and what the other hears won’t coincide. There are gaps between what we show and what we hide, what we say and what we mean, what we have and what we want. It is these gaps, the dark places, that interest him insofar as they speak to our private, hidden, self. It is these gaps that separate us that Cohen ponders in this remarkable book.